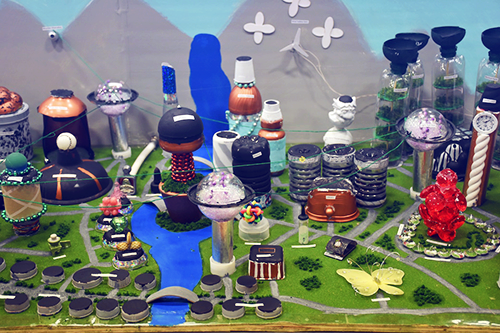 Future City is a project-based learning program where students in 6th, 7th, and 8th grades imagine, research, design, and build cities of the future. Starting with the question, “How can we make the world a better place?” students imagine, research, design, and build cities of the future that showcase their solution to a citywide sustainability issue. Special Awards from sponsors (Special Awards change annually depending on the sponsors each year). Remember to register your team for our regional Special Awards. 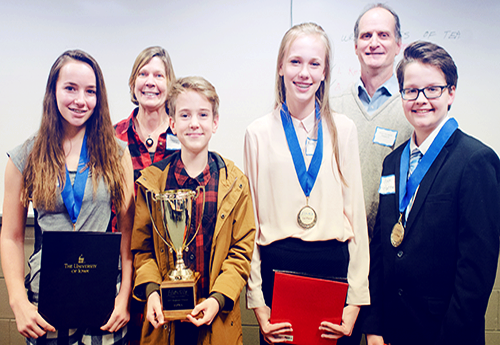 First Place Regional winners – Receive trophy (Regional and National), medals. This team will go on to compete in the National Finals in Washington, DC in February. We will present “Special Awards” at the 2019 Iowa Regional Future City Competition. Teams of judges from local businesses will talk to students about their cities. Prior to the competition, each team will select the Special Awards for which they would like to be considered. Model that displays the most diverse use of materials and shapes. The design that employs the best land surveying practices, taking into consideration the high standards used by surveyors to help protect the public’s safety and welfare. Model with the most original and unexpected use of recycled or re-purposed materials to portray an aspect of the community. 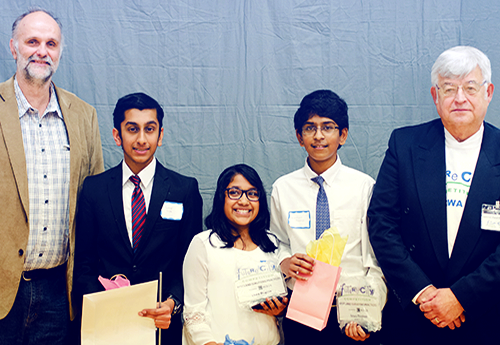 Sponsored by: MMS Consultants, Inc.
Students who show innovation in stormwater and/or floodplain management. The team with the best example of the PDCA cycle, or plan-do-check-adjust, that demonstrates evidence of: developing a plan, checking progress as they proceed with that plan and then making adjustment in the work to achieve the desired result. Model with the most innovative method or technique for generating or transmitting power or providing communications. Model that integrates the most innovative system (e.g. transportation, water and waste water) for a community. The model that demonstrates the best construction principles which insure its sturdiness and durability. City that demonstrates the best environmental vision for clean air, water, and land. Along with your team’s choices of Special Awards, all teams are automatically eligible for the following awards as well! Best City Essay that meets all competition requirements and has the highest score as voted on by judges before Regional Competition. Best City Model that meets all competition requirements and has the highest score as voted on by judges during the Regional Competition. Best Virtual City that meets all competition requirements and has the highest score as voted on by judges before Regional Competition. Team Check-in and Penalty Checks: 8:00-9:00 a.m.
Special Awards Presentations and Judging: 9:15-10:00 a.m. Round 1 of Judging: 10:15-10:30 a.m. Round 2 of Judging: 10:35-10:50 a.m. Round 3 of Judging: 10:55-11:10 a.m. Round 4 of Judging: 11:15-11:30 a.m. Round 5 of Judging: 11:35-11:50 a.m. Break for Lunch/Score Tabulations: 12:00-12:45 p.m. Awards Ceremony and Top 5 Announcement: 12:45-1:15 p.m.
Top 5 Judging Rounds: 1:45-3:00 p.m. Final Score Tabulations: 3:00-3:15 p.m.
Top 5 Announcements and Awards Ceremony: 3:15-3:30 p.m.
We’re always looking for great mentors, teachers, and judges. Sign up today to join us! Each team should read the Future City Handbook in its entirety to make sure all aspects of the competition are understood. Please also carefully read the Official Competition Rules on page 83 of the Handbook as well. An FAQ section is included below for quick reference and to hopefully help answer any additional questions you may have. Q: Where is the Iowa Competition held? A: Our Regional Competition takes place at Prairie Point Middle School. Q: Is it necessary to have an engineer mentor work with the students? A: We highly recommend it. Engineers, architects, and other technical professionals bring practical experience and advice on designing and building the city. We want students to understand how technology impacts our lives. Because of the nature of the competition, a mentor from the engineering community is preferred, but a mentor can be anyone involved in a technical profession. 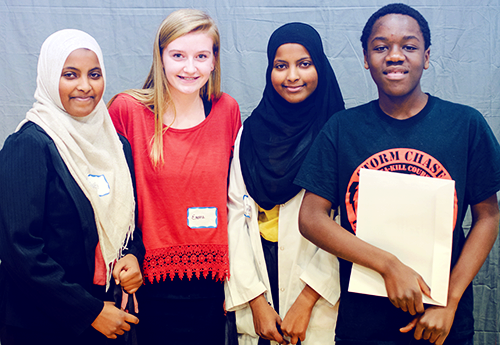 Each team is required to have a mentor either way, as the Official Team format includes three student presenters, one educator, and one mentor. Mentors can be engineers, technical professionals, architects, urban planners, city managers, or others who work in the engineering and technical community. Q: What is the financial cost to participate? A: There is a $25 registration fee per organization due each season for this Region. For each team, there will be some cost in building the city model, and perhaps a small cost for presentation materials. There is a $100 limit per team for all model and presentation materials, whether direct or in-kind. Schools may solicit support from local community organizations. The model requires students to use recyclable materials, which doesn’t count toward the $100 limit. It is also permissible for the engineer volunteers to generate or solicit support. A Competition Expense Form is required from each team Make sure to bring this completed form and all receipts with you to the Regional Competition. Q: If we win, are our expenses paid to go to the National Competition in Washington, DC? A: The National Future will provide airfare and lodging for the five team members: the three students, one teacher, and one mentor. Some meals and food vouchers are provided. Team members will be responsible for all additional expenses such as ground transportation (including to and from their local airport,) off-site meals, attractions, and souvenirs. Q: If we win, can our parents and families go with us to Washington, DC? A: Yes, but they must cover their expenses and secure their lodging. Q: How much time will a teacher have to devote to the project? A: Teachers spend approximately 35-45 hours on the competition. Of course, all teams and coaches are different, but this is a reasonable range to expect. It is the teacher’s responsibility to schedule time for the students and the engineer-volunteer to work together and to oversee work done on the project. Q: How much time will students need to spend on the project? Q: How much time will the engineer-mentor need to spend on the project? A: Typically, most engineers or mentors devote approximately 12-14 hours. The engineer mentor should be available to provide advice and technical assistance to the students. It is hoped that he or she will be available whenever the students work on the project. Q: Must all students on a team be from the same school or organization? Q: Can more than one team per school or organization compete at the Regional Competition? A: Yes, the Iowa Region permits up to 4 teams from a single school or organization to attend the Regional Competition. A: Teams come in all sizes—a whole class, a group of 10 students, or 3 students. As you near competition time, you’ll need to identify the three students who will officially present the team’s work at the Regional Competition. Q: If my team has more than three students, can they all attend the Regional Competition? A: Absolutely! We strongly encourage all students to attend. However, only the three presenters are eligible for Special Awards, shirts, and advancing to Nationals if selected. A: Teams must be registered online by October 31, 2018. Q: How many SimCity software codes will a school receive? A: Each registered school will receive up to two codes which will allow them to download the SimCity software online. 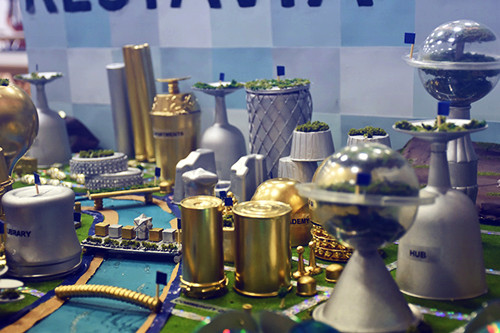 Additional codes may be requested by emailing info@futurecity.org, but they are not guaranteed. Q: I am not familiar with SimCity. Will I receive any instructions? A: Instructions are provided on the Future City National Website, through webinars, and also at Future City resources and the SimCity website. 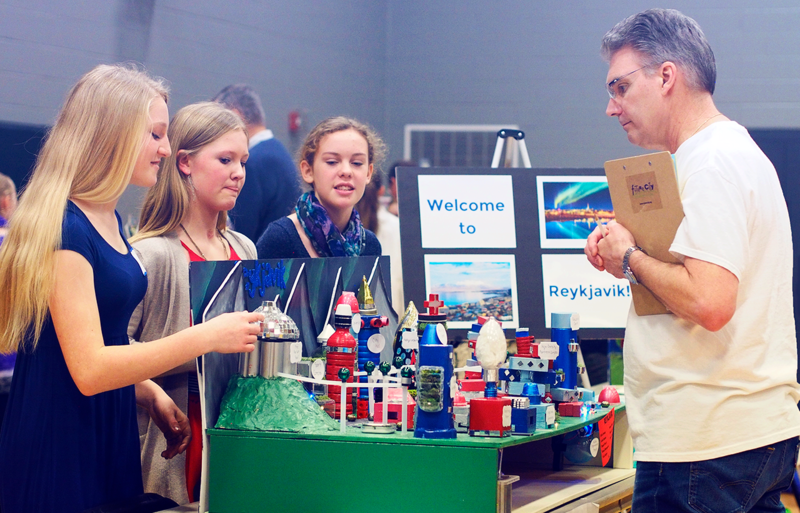 Q: What grade levels are permitted to participate in Future City Competition? A: Sixth through eighth grades can participate. Q: Who do I contact to find Mentors? Q: Can multiple teams from the same organization be included in the top 5 teams at the Regional Competition? A: According to the National Future City Competition Program Handbook, only the top scoring team from an organization is allowed to advance to the final round of the Regional Competition. We have encountered multiple top-scoring teams coming from the same organization in the past, and this is part of the reason why we have a limit of four (4) teams per organization being allowed to compete at the Regional Competition. We want to ensure organizations across the state have the best opportunity to be represented. Q: What is the official name and EIN of Future Cities for donation purposes? A: Our official name is Future City Iowa. We are a 501(c)3 charitable organization under NewBoCo; all donations are tax deductible. Our IRS determination letter is available upon request. Please consider contributing! There are 5 competition components worth a total of 258 points. Each form has it’s own point value and deadline. Please refer to the rubrics, guidelines, and competition rules outlined in your 2018-2019 Future City Handbook to ensure you have up-to-date information and the best chance to meet requirements. Due January 9, 2019 – The SimCity map uploaded to the CMS. Due date is January 9, 2019 – Uploaded to the CMS. Due date is January 26, 2019 – day of the competition. Due date is January 26, 2019 – day of competition. Due date is January 9, 2019 – Upload to the CMS. Due date is January 26, 2019 – the day of the competition. Please bring this form with each team the day of the Regional Competition. All Future City Competition Forms are now available as writeable PDFs. Future City starts every year with an important challenge topic—how can we make the world a better place? To answer it, 6th, 7th, and 8th-grade students imagine, research, design, and build cities of the future that showcase their solutions that address global sustainability issues. Students from across Iowa have written 1500-word essays, created virtual cities, and designed scaled 3D models of their cities. Now it’s time for them to present their city for a chance to win the Iowa Regional Competition. 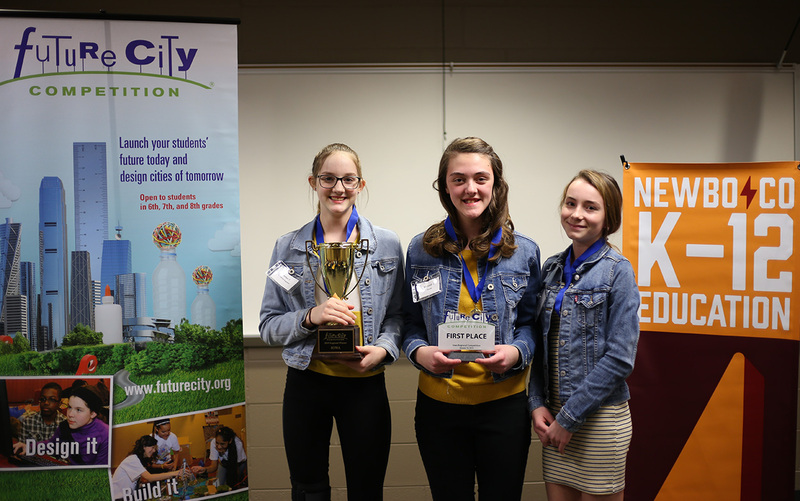 The winner of the Future City Iowa Regional Competition receives an all-expense paid trip to Washington, D.C. to compete in the National Competition. You will judge four table top models and four presentations. Detailed scoring forms will be provided. You will serve on a panel with other judges. This is a sample schedule – official schedule is coming soon. Please contact our Regional Coordinators at k12@newbo.co, if you have any questions. Thank you to our generous Future City 2018-2019 sponsors and supporters! We gladly accept in-kind donations! They will go on to represent Iowa at Future City Nationals in Washington DC February 15-20, 2019.